"These are very good, and very easy; the meatballs are made in cooked in a slow cooker. I sometimes like to add a can of chunk pineapple when I make them, and then I substitute pineapple juice for the water." In a medium size mixing bowl, combine chili sauce, cranberry sauce, sauerkraut, water, and brown sugar. Mix well. 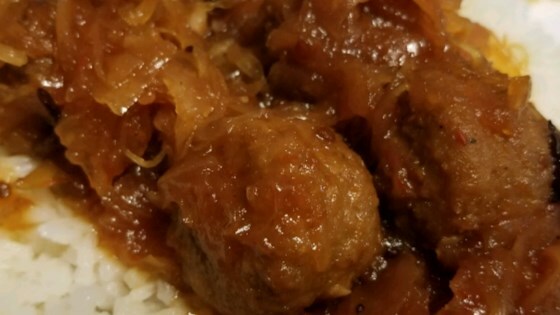 Pour sauce and meatballs in a slow cooker, stir. Cook, covered, at a medium temperature for 4 hours. Stir occasionally to coat meatballs. Loved it. Cut the sugar in half and found it sweet enough. Doubled the meat balls. Cooked on high for 1 hour and then 3 hours on low. Will do again for sure. A little too sweet for my taste but all the party goers LOVED them. I used 1/2 the sugar as some others suggested.